Silica Gel Dehumidifier requires no electricity or refilling. 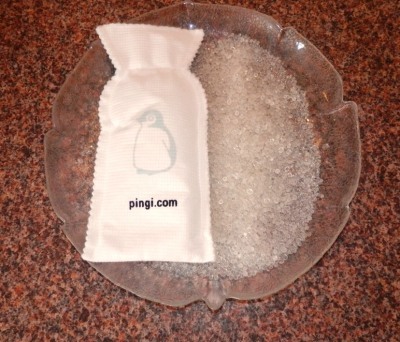 Outstanding PINGI Silica Gel Dehumidifier. They require no electricity. Using our product will therefore not add to a higher electricity bill. Unlike other unattended electric dehumidifiers, our silica gel dehumidifier will never be an electrical hazard. You do not have to refill the silica gel dehumidifier. The bag is sealed and gets recharged for repeated use. The implication is that if you follow our operational instructions, this product can be used for years and becomes much more cost effective than competitive brands over time. You are able to recharge the silica gel dehumidifier with heat. You can place the product in a microwave oven (the easiest and most effective way) or leave the product in the sun. Some competing rechargeable dehumidifiers take several hours to recharge either electrically or in a conventional oven. Our microwave drying means the PINGI is ready for use in a few minutes. Silica Gel Dehumidifier with contents. Silica gel dehumidifiers/moisture absorbers make ideal moisture traps in enclosed areas of your home, car, boat or caravan. Whether you place the absorber in a cupboard, pantry, wardrobe, chest of drawers, bathroom or in a tool box, these products can help prevent mould or rust. Why not get your own silica gel dehumidifier? All online orders in Australia are postage free!